Though the tendrils of summer are gently wrapped around October so far, with our temperatures still rising into the 70s, fall is slowly working its way in. From the crisp quality of the air, to leaves gently floating to cover the sidewalk, to the chilly evenings and morning perfect for a warm cup of cider, fall is almost in full bloom. As the leaves still make their transition from the vibrant green of late summer to the deep scarlet, golden yellow and maple orange that shout fall is here, the fall festivals have already arrived. With the great variety of attractions in Gatlinburg, Pigeon Forge and Sevierville, there are plenty of special, once a year events to pack your weekends full of fall-flavored fun. Until November 1st, Ober Gatlinburg is hosting their 6th annual OktOBERfest, a Bavarian festival with food, music, and a myriad of activities. This seasonal specialty is based on the traditional Oktoberfest in Munich, and features German specialty foods like strudel, schnitzel, bratwurst, pretzels, turkey legs and sauerkraut. For those visitors of legal drinking age, a Bier Garten is open for sampling Thursdays through Sundays. Outdoor games and an authentic, lederhosen-clad Oompah Band add even more fun to the festival. In addition, Ober Gatlinburg’s other seasonal attractions are open, including the indoor ice-skating rink, an arcade, wildlife encounters, a carousel, mini-golf, chair lift, maze, and chair swing. Taking the aerial tram up and down to Ober is sure to provide even more scenic views ideal for fall leaf viewing. 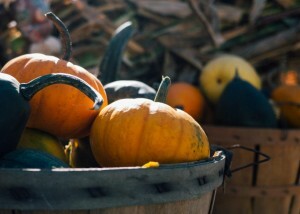 The Smoky Mountain Harvest Festival is also running through Halloween. Gatlinburg itself is decorated, with many events running concurrently. The Gatlinburg Craftsman’s Fair, running until October 25, features more than 200 booths of handmade artisan goods. Shoppers can enjoy live country and bluegrass music at the Gatlinburg Convention Center while they shop and chat with the craftsmen. Ripley’s is joining the fall themed fun with their Fright Nights, weekends in October, at Ripley’s Haunted Adventure. Ripley’s Aquarium of the Smokies is the kickoff point for the Gatlinburg trick-or-treaters on Halloween, complete with games, candy, costumed characters and inflatables. The Wears Valley Fall Fest delights locals and visitors of all ages with games, activities, crafts to make, crafts available for purchase, and delicious local food. This year, it took place October 16-18. If you love cars and the fall, Sevierville and Pigeon Forge will have you set for life. From Corvette Expos to the Pigeon Forge Fall Rod Run, there are plenty of unique car shows with the breathtaking backdrop of the ever-changing Smoky Mountains. Living in close proximity to these events is just one of the benefits of Smoky Mountain living. Fall in particular makes us all want to be snug in a cabin with a roaring fire after a day spent hiking among the colorful leaves. We currently have listings in Gatlinburg, Pigeon Forge, Sevierville, and Wears Valley. You can explore all of our listings here. As always, the Jane Terrell team is here for all of your real estate needs.